It's America's all-time #1 dice game with a National Parks twist. Roll a hiker, pine trees, binoculars, tent and canoe - that's a Large Straight! Now adventurers can pack up their favorite dice game for on-the-go fun! Includes a dice cup that holds all components, 5 custom dice, score pad, pencil and Fun Facts about the environment and how you can help to preserve the National Parks. 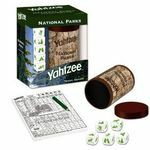 A portion of the purchase price of this game will be used by the National Park Foundation to support the restoration and preservation of America's most treasured resources.